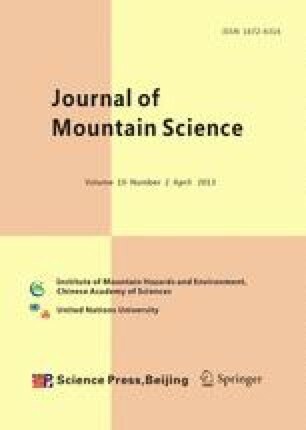 Debris flows in Jiangjia Ravine in Yunnan province, China are not only triggered by intense storms but also by short-duration and low-intensity rainfalls. This reflects the significance of antecedent rainfall. This paper tries to find the debris flow-triggering threshold by considering antecedent rainfall through a case study in Jiangjia Ravine. From 23 debris flow events, the I-D (Intensity-Duration) threshold was found, which is very close to the line of 95th percentile regression line of rainfall events, representing that 95% of rainfalls can potentially induce debris flows and reflects the limitation of I-D threshold application in this area. Taking into account the effect of antecedent rainfall, the debris flow-triggering threshold for rainfall quantity and intensity is statistically and empirically derived. The relationships can be used in debris flow warning system as key thresholds. Coupling with the rainfall characteristics in this area, new thresholds are proposed as triggering and warning thresholds.